I know what you are thinking. If I were a human statue, how long could I stand it? How long could I resist the urge to go all Georges St-Pierre on the idiots who taunted, tempted and tested my patience. What, you may ask, would cause a human statue to lose it? You are in luck. We have an answer. It is the Wet Willy. 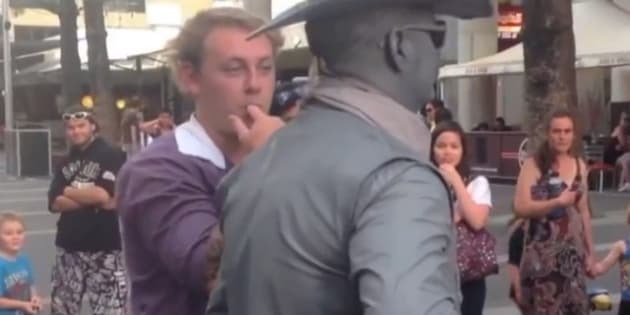 A video out of Australia this week demonstrated what happens when a human statue gets pushed too far. In the video, a man is seen harassing Mr. Statue front, back and all around. After repeated mugging and teasing, the statue keeps his cool. It is only after the man goes for broke, licking his finger, inserting into the statue's ear and wiggling it – the dreaded Wet Willy – that the statue breaks character and plows him in the face. What he did next is utterly fantastic. He goes back into character like nothing happened.